How are you guys doing? Ramadan kareem❤️ Face sheets masks are all over the internet and it is gaining so much hype these days. Nevertheless, facial sheet masks are worth the hype. When I started off with them I knew only two brands- Innisfree and The face shop. But now I have explored many other brands too. 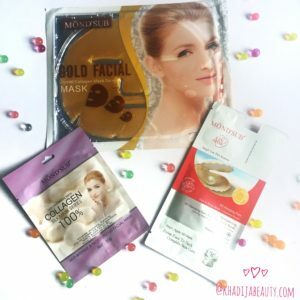 Today I am going to review 3 facial sheet masks from a brand called Mond’Sub. Facial sheet masks are a part of korean skincare routine and now they are being followed by every part of the country. These are best for instant hydration and glow. Moreover, there are sheet masks available specifically focusing on a particular skin problem. So let’s get started with Mond’Sub facial sheet masks. Aqua, Glycerin, Propylene Glycol, Arbutin, Betaine, Sodium Hyaluronate, Hydroxyethylcellulose, Carbomer, Peg-40 Hydrogenated Castor Oil, Parfum. Just apply on your face and keep it for 15 to 20 minutes and remove. Feel the difference immediately. What do the brand claim? 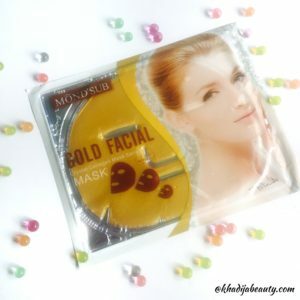 Give your skin a glorifying makeover sitting at home with Mond’Sub Gold Facial Mask (Pack of 1), which is highly effective anti-aging facial mask and provides an intensive treatment which nourishes the skin giving it a facial glow. It promotes natural collagen production giving you a natural sheen. This luxurious skin treatment is being used by many spas internationally. I was very excited to use this because of the name “gold facial mask”. The another reason for my excitement was that this facial sheet mask was not like the other sheet masks. The sheet is thick and because it was dipped in serum, the sheet was swollen. It is golden in color and very soft and rubber-like in texture. The eye hole and the mouth area of this sheet was small and that is why I faced problem in placing it on my face. Even though the sheet is thick it rested on my face without slipping off. But the shape of this golden face mask didn’t fit well on my face. Now coming to the effectiveness it did hydrate my skin well as it claimed. I kept all of these three sheet masks in the freezer for minutes and used the chilled mask on my face. After taking this facial sheet mask off my face I gently massaged all of the leftover serum into my face. Another thing which I didn’t like was that the serum was sticky. So after massaging the serum well I kept it on my face for 10-15 minutes and then I washed it off. Now after washing I can feel my skin super soft and hydrated. I was not well and so my skin was acting kind off weird( oily T-zone and dry cheeks). But after using this gold facial sheet mask all of my dry skin disappeared. It did clean my pores too. I didn’t feel the need of moisturiser after using this mask. And it kept my face hydrated for the whole day. All in all I would give it 4/5. Other than being sticky and not fitting well on my face I loved everything about this. Do not reuse this facial sheet mask. Aqua, Propylene glycol, Glycerin, Collagen, Tremella Fuciformis (mushroom) extract, Hydrolyzed pearl, Lactobacillus, Hyaluronic acid, Allantoin, Fragrance. Just apply on your face keep it for 15 to 20 minutes and remove. Combining the pearl extract from the deep sea, which contains rich minerals, vitamins and amino acid, added with hyaluronic acid and seaweed extract, Mond’Sub Pearl Revitalizing 3D Hanging Ear Face & Neck Mask efficiently hydrates and moisturizes the skin. This facial sheet mask is again very different. I have never used any 3D masks before so this was a whole new experience for me. This mask claims to contain mushroom extract and so many impressive ingredients including hyaluronic acid?Hyaluronic acid is said to be an ingredient that gives deep hydration to the skin. Ramadan has started and due to fasting I am unable to give enough hydration to my skin and this is when such masks come handy. I took maximum advantage from it. Thanks to Mind’Sub for collaborating and sending these at the perfect time. 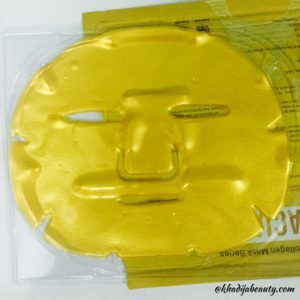 This facial sheet mask is cut out in such a way that it has 3D hanging ear face and neck sheet and apart from it has a separate pouch of vitamin C essence. So this is a two step process where we have to keep the facial sheet mask on the face for 15-20 minute. Then after taking off the sheet, the second step is to massage the vitamin C serum into the skin. This sheet was thin and was placed well over the face. It was much comfortable compared to the previous one. This facial sheet mask was fully well immersed with the serum and the serum was very sticky(I mean it) After some time I started feeling tacky on my neck and then I had to cut off the sheet that was on my neck. So I would suggest you try this mask before taking shower. It doesn’t have any prominent smell though! Vitamin C essence has a thick syrup like consistency. And after massaging it, I washed off my face. I could feel my skin soft, hydrated and fresh. It moisturized my face well and gave me a smooth skin. It would give it 3.5/5 because it was very sticky. Water (aqua), Propylene Glycol, Glycerin, Cherry extract, Rose oil, Ceramide, Seaweed extract, Hyaluronic acid, Fragrance. 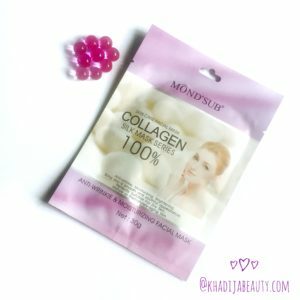 Combat the signs of aging with Mond’Sub Anti-wrinkle & Moisturizing Facial Mask (Pack of 1), which diminishes wrinkles and fine lines giving you a bright glow. Formulated with several plant extracted essences, this formula is specially designed for dry skin, mature or prematurely aging skin. This is my most favorite one among the three facial sheet masks. Everything about this was perfect. This facial sheet mask was protected between two films. The sheet was very thin and was fully drenched in the serum. The eye hole and mouth hole were of a proper size and the sheet was placed so very well on the face. Another best thing about this silk facial sheet mask was that the serum was not sticky and had a watery consistency. After removing the sheet from the face as usual I massaged the serum well into the skin. And while massaging I noticed that the serum of this facial sheet mask is on the oilier side. Maybe because it contains castor oil in it. This facial sheet mask is meant for dry skin, but it works very well even on oily skin. I would give it 4.8/5. You can keep the extra serum in the fridge or freezer and use it next day also. All the three facial sheet masks are good in providing moisture and make the skin super smooth. None of these sheet masks gave a glow on my face and it’s obvious. Only when you use it regularly for a long time you can observe the glow. But when it comes to hydration aspect, it gives instant hydration to the skin. If You are okay with the sticky feeling then you can go for the first two facial sheet masks. My personal favorite is the last one that is anti-wrinkle & moisturizing facial mask. Do give them a try, I am sure you will like the after effects. 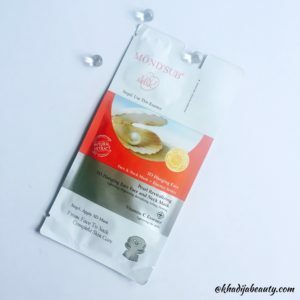 I have just started using facial sheet masks, so far I have only tried The Face Shop mask sheets and they were good but now am looking forward to trying Mondsub brand too 🙂 It is important to use a facial sheet mask atleast once a week to keep skin glowing..great review! I am also trying their sheet mask ?but yeah I agree the serum is quite sticky but the result us quite wonderfull ? I got the eye patch and absolutely loved it. Can’t wait to try out their sheet masks. And same pinch because I too keep my masks in fridge before using them!! I love the cooling effect.?? I’ve got the two of them, the gold one and the anti-wrinkle. Will review very soon. I would like to try gold facial mask… looks like a worthy product.